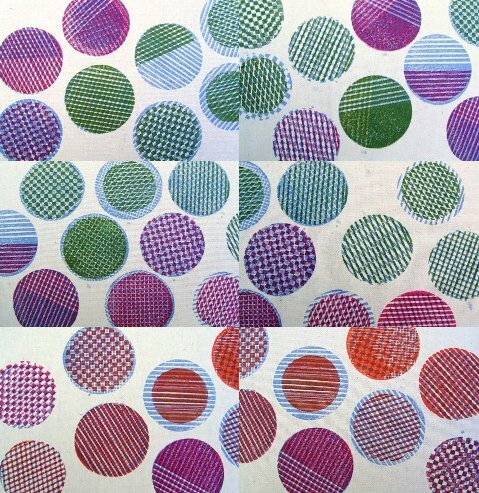 By happy accident, these tiny prints show exactly what I was trying to convey about block printing in a short piece I wrote for Re-Nest the other day. Layering of colours, on-the-spot pattern choices. They're intended as buttons, but as soon as I started printing these tests my mind flew to allover patterns. Wow, these are so cool! OMG - Those are awesome!!! Those checks!!! So gorgeous and I'll admit I am pretty partial to circles. I could imagine a skirt in that material. Just lovely. Fun patterns! And interesting article.